metalblade.com/oni. “Barn Burner” is presented in lyric video form, directed by Wovenwar/ex-As I Lay Dying guitarist Nick Hipa. The video for the first single, “Eternal Recurrence”, can be viewed here: youtube.com. Play-through videos for “Barn Burner”, showcasing the unique talents of heavy metal Xylosynth player Johnny D and guitarists Martin Andres and Brandon White, will be revealed soon. Ironshore takes listeners on an absorbing ride that provides ample opportunity for head-banging, singing along and deep introspection. Formed in 2014, the initial vision for Oni was, “to be the band I never got to see”, explains Jake Oni. Ironshore was produced by Josh Wilbur, primarily recognized for his work with top metal artists Lamb Of God and Gojira. 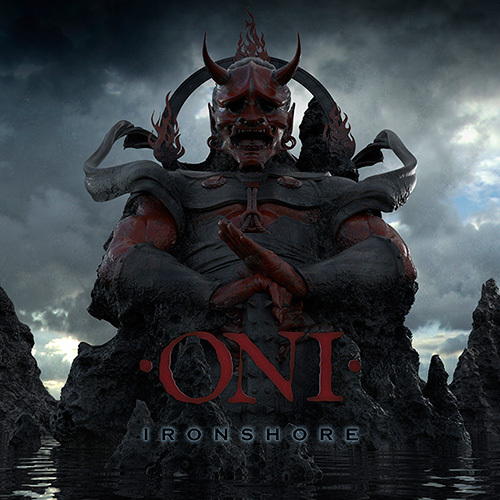 Through this connection, Oni was able to reach out to Lamb Of God vocalist Randy Blythe, who contributed his inimitable style to “The Only Cure” – one of Ironshore‘s heaviest moments. With their influences rooted in progressive metal, Oni‘s sound can be compared to the genre’s heavy hitters – The Human Abstract, Protest The Hero and Between The Buried And Me – yet they remain truly unique. With Jake Oni handling vocal duties, Martin Andres and Brandon White on guitar, Chase Bryant on bass and Joe Greulich on drums, they are also perhaps the first metal band to feature a Xylosynth player, Johnny D, which adds an intriguing dynamic to the nine tracks found on Ironshore. Oni is currently on the road with Max & Iggor Cavalera’s Return To Roots tour through October 21st. Following that tour, Oni will join the “I Worship Chaos” tour line-up, beginning November 23rd and featuring headliners Children of Bodom and guests Abbath and Exmortus (the latter of which they will perform five off dates with prior). In early 2017, Oni will join Devil You Know as direct support on a special UK trek. See below for all dates! Dec. 9 – Dallas, TX @ Gas Monkey Live!